A few years ago, a band called Jars of Clay picked their name from this verse to make the point (I assume) that their ultimate message – that we can know God through faith in Jesus – is far more powerful and valuable than the rock band that sometimes sings about it. If you went to The Container Store in Paul’s day looking for something to keep your most valued possession in, you’d walk right past the “12 for $1” sign on the clay pots and look for a cool-looking display jar (or maybe something with a lock on it). Human beings are weak, fragile, flawed. Why – how – would God allow us to carry the most valuable truth in all of human history? Today’s verse answers the question, and it’s what we’ll be thinking about this week. 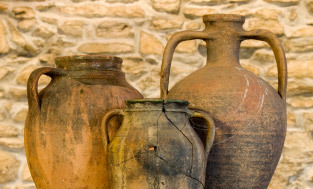 Think: What evidence have you seen in your life that you are a “jar of clay,” that you are not powerful on your own to carry the message of God’s grace? What evidence have you seen of God’s power in and through you? Pray: As a Christian, thank God for placing his treasure in you and showing his power through you. Do: Notice this week evidence of your weakness and God’s power in your life. Today’s verses sound a little like a coach’s half-time speech to a team that’s getting beaten badly but still has a chance to win if they can turn things around. Paul’s point is exactly the opposite. He just finished saying we have God’s treasure in our human clay jars to show how powerful he is. The point isn’t that we’re tough enough to take a beating and bounce back. The point is that a clay jar that has been pressed on every side should be broken. Instead – because of the powerful treasure in us – we’re still in play. The power of God in a Christian’s life will not keep us from experiencing terrible things; it will keep those terrible things from destroying us. It takes his kind of power to do that. Think: Do you know any Christians who have experienced some terrible things that should have destroyed them? Who do they give the credit to for keeping them going? Pray: Thank God that his power in you is strong enough to get you through the worst circumstances in life. Do: Notice this week how your Christian friends or family talk about hard times and God’s power. If God is really on our side, why do so many terrible things still happen to Christians? If God is good and powerful and loving, wouldn’t he stop all of our suffering before it started? It’s a fair question. According to some scholars, it’s a question Paul’s opposition was asking about him. If this guy is really an apostle of the living God, why is he always getting beaten, attacked, jailed, and persecuted? Shouldn’t God’s man be protected from harm? Our suffering – especially for Jesus – makes us like him in his humanity. We are weak enough to be hurt. But God is strong enough in us to keep us going, to use us in powerful ways, to prove that he is powerful enough to change the world through fragile human beings. Think: How has God’s power been revealed in your life and in spite of your weakness? Pray: Thank God that he is powerful enough to keep you going even when life is hard. Do: Notice this week how God uses hurting people to accomplish meaningful things. Do you know anyone who seems to enjoy describing everything going wrong with his or her body? You’re more likely to find it in older people. To be fair, they have more illnesses, injuries, and medical disorders to catalog and describe to whomever will listen. He also found big purpose in all his wounds, scars, and aches; they contributed to bringing life – bold, healthy, eternal life – to all the people Paul reached with the message of Jesus’ life, death, and new life for us. Paul walked with death so others could come to life. Think: Have you experienced any physical suffering? Do you see any greater purposes for it? Would it help if you did? Pray: Read Romans 5:3-4 and thank God that your suffering always has a point. Do: Listen this week to hear how people talk about their physical pain and suffering. Is your God the same one that Paul served and worshipped? Most Christians will immediately say, “yes, of course.” But somehow, we don’t expect God to do in our lives what he did in Paul’s life. We’re not convinced Paul’s words about God will fit in our mouths. Paul believed he worshipped the same promise-keeping God that Psalm 116 talks about. He took those words for his own life. It describes facing death and choosing to trust the God who gives life, who delivers, who raises the dead. Paul believed in that God, so he talked openly about his own suffering and God’s power to do incredible things through him in spite of his own weakness. You and I are weak. We suffer and struggle. Is the God of Psalms 116 and of Paul your God, too? Is he powerful enough to do amazing work through your clay pot of a life? Think: Why do you think we don’t always give our God the credit for being the same God described in the Bible? If you are convinced he is that God, will you speak of your weakness and his strength in you? Pray: Ask God to give you the faith and courage to trust him as God and to trust him to be strong in your weakness? Where does your confidence to talk about what you believe come from? What is it that you know that keeps you from being afraid to talk about God’s strength in your clay pot of a life? Paul spoke because he believed in resurrection. If this is the only life we have, every injury, every illness, would be a great loss. Getting older, getting sick, moving closer to death – all of life would be a tragedy as we marched slowly and inevitably toward the end. But Paul was not afraid to suffer – or talk about his suffering for Jesus’ sake – because he believed in the next life, the one that doesn’t end. The one that doesn’t hurt. He believed he (and all believers) would be raised from the dead and find themselves standing with God, new and whole and finished. He wasn’t afraid to use this life up on the way to that one. Are you? Think: What are you afraid of losing in this life? What can you lose here that you won’t get back – and far better – in eternity with God? Pray: As a Christian, thank God that you know that the one who raised Jesus from the dead will also raise you with Jesus and present you in his presence. Do: Read more about this idea in 1 Corinthians 15:12-28. What are you living for? If everyone’s life on this side of eternity gets spent, gets used up until they die, what will you spend yours accomplishing? What is worth sweating and bleeding and suffering for? You’re not an apostle – and might not even be thinking of going into “full-time ministry” – but you couldn’t do much better than to borrow Paul’s purpose statement from today’s verse for why he was willing to use up his days doing such hard things. So what are you willing to live, work, suffer, and die for before you get to heaven? Think: Which is bigger in your life today – the goal to avoid hard things for your comfort or the goal to do hard things for God’s glory? Pray: Ask God to help you to feel so motivated by bringing him glory that you’re willing to use your life up serving people who will thank him for his grace. Do: Look for an opportunity to serve someone this week in way that’s not necessarily easy or comfortable for you.